There are currently 2 homes available for sale in Rocky Point Estates. The list prices are $314,900 and $699,999. This is an average list price of $507,450 or $205.73 per sq. ft. of living area. There are 3 homes under contract which has not sold to date. List prices ranged from $329,900 up to $398,500. This works out to an average list price of $371,133 which is $257.76 per sq. ft. of living area. This home was on the market for 13 days before going under contract. In the past 12 months, 4 homes have sold in Rocky Point Estates. Sales prices ranged from $306,500 up to $475,000. This is an average sales price of $387,125 which works out to $219.87 per sq. ft. of living area. These homes sold for an average of 97% of the last list price and took an average of 27 days of being on the market prior to receiving an accepted offer. Rocky Point Estates is an HOA community in the eastern middle of Rocky Point. Homes on Orange St, Nassau Ter. and the north side of Matousek St. had the opportunity to join this HOA when it was developed. For the very reasonable sum of $145.00 per year, members have access to a large park with a boat ramp and picnic grounds available for their exclusive use. In addition to the ramp and picnic area, there’s a 29 slip marina suitable for boats up to 30’ in length. These docks can only be owned (or leased) by members in good standing within the Rocky Point Estates HOA community. Individuals within Rocky Point Estates have the option to sell or trade docks within the community. 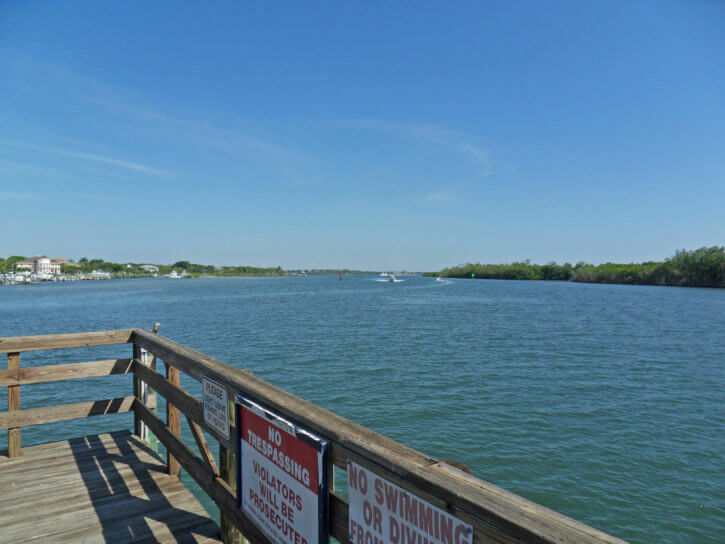 This boat ramp and the docks are in a highly desirable location that’s only about a mile or so from the open waters of the Atlantic Ocean through the Saint Lucie Inlet. Fisherman in this community love the fact that they can be casting their lines in deep water just minutes after leaving the dock or ramp. There are just over 170 homes belonging to the association. Homes were first built in this community in 1959 and the latest home was just completed in 2014. Homes are of all styles and sizes ranging from 5 bedroom, 4 bathroom home on almost a half-acre down to under 1,000 sq. ft., 2 bedroom, 1 bathroom homes on under a quarter of an acre lots. Children residing in Rocky Point Estates attend the Martin County School District with current assignments to Port Salerno Elementary, Murray Middle and South Fork High Schools. Residents are also close to a number of wonderful restaurants and first class medical facilities.